We agree with Sekine et al. and endorse their view that screening smokers for evidence of chronic obstructive pulmonary disease (COPD) will help identify those for who computed tomography (CT) screening for lung cancer is most appropriate. We outline below further evidence supporting this viewpoint, specifically how the inclusion of COPD in screening eligibility might improve both sensitivity and specificity of CT screening for lung cancer. With respect to sensitivity, current selection criteria for CT screening for lung cancer are limited to age and pack-yr exposure, despite this having poor predictive value. If future CT screening is limited to those who meet the eligibility criteria used in the National Lung Screening Trial (NLST), we estimate only 47% of all lung cancers would be eligible for screening and over 50% of lung cancers will be missed. Recent studies report that about 67% of lung cancer cases have underlying COPD based on spirometric criteria (Global Initiative for Chronic Obstructive Lung Disease (GOLD) 1+). This means that if all current/former smokers with COPD were screened, regardless of age and pack-yr exposure, approximately two-thirds of all lung cancers would be eligible for screening. With this in mind, we have recently developed a risk model for lung cancer that incorporates age, pack-yrs, COPD and genetic factors (family history and genetic variants) that in combination identifies current/former smokers (with and without COPD) at greatest risk. We estimate that this model identifies about 80% of all lung cancers (authors’ unpublished data), a finding that is currently undergoing validation in a subgroup of the NLST. Based on these observations, we suggest that the sensitivity of eligibility criteria for lung cancer screening would be significantly improved using a multivariate approach. A second aspect to optimising CT screening for lung cancer is establishing eligibility criteria that maximises specificity or the number of cancers identified per individual scanned (i.e. lung cancer detection rate). Improving specificity will improve cost-effectiveness and minimise harm to low risk individuals. To date, most CT screening trials have used age and pack-yr exposure to define eligibility criteria and achieved lung cancer detection rates between 0.5 and 1.0% per year. These detection rates are not significantly altered by using wider age and pack-yr criterion. However, there is growing data to suggest that a “COPD-based” (but not exclusive) approach to help define screening eligibility might substantially improve these rates. The Pittsburgh (PA, USA) study is the only CT screening study to date that has published the results of spirometry-defined COPD and CT-based emphysema in both the screened cohort and lung cancer cases. This study showed that over 3 yrs of screening, the lung cancer detection rates were 1.0%, 4.5% and 5.1% in those with normal lungs, those with spirometry-based COPD (GOLD 1+) and those with CT-based emphysema, respectively. This shows that compared to screening participants with normal lungs, detection rates were 4–5-fold greater in those with spirometry-based COPD or CT-based emphysema. These findings are supported by a large prospective study by Mannino et al. showing over a 20 yr follow-up that lung cancer occurred 5-fold more frequently in those with spirometry-based COPD compared with normal lung function. Lastly, Bechtel et al. screened exclusively current/former smokers with COPD in a 1 yr community-based CT screening study and reported a lung cancer detection rate of 4–6%. Based on these observations, we suggest that lung cancer detection rates (specificity) can be improved by using a multivariate approach to CT screening eligibility that includes variables indicative of COPD. 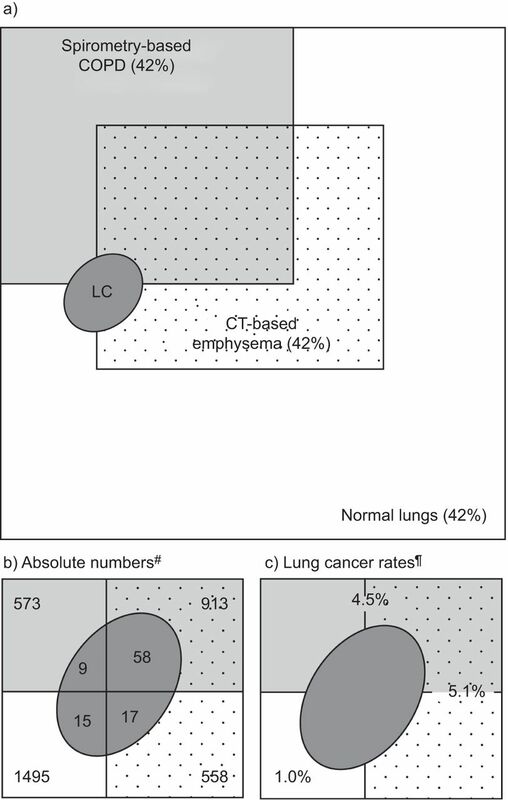 Relationship between a) spirometry-based chronic obstructive pulmonary disease (COPD) (Global Initiative for Chronic Obstructive Lung Disease 1–4, light grey shaded area), computed tomography (CT)-based emphysema (area with dots) and lung cancer (LC) (n=99, dark grey oval) detection in a CT screening study. Normal lungs are shown as white area with no dots. b) #: based on data from, screening participants: spirometry-based COPD, 1486 (42%) out of 3539; CT-based emphysema, 1471 (42%) out of 3539; “COPD disposition”, 2044 (58%) out of 3539; normal lungs, 1495 (42%) out of 3539. c) ¶: lung cancer detection rates were calculated as follows: COPD, 67 (4.5%) out of 1486; emphysema, 75 (5.1%) out of 1471; normal lungs, 15 (1.0%) out of 1495. The multivariate approach described above is consistent with recommendations from the National Comprehensive Cancer Network (NCCN) in which they suggest that, in addition to the NLST criteria, smokers of younger age (≥50 yrs) and lower smoking exposure (≥20 pack-yrs) should also be screened if they have one additional risk factor such as family history of lung cancer or COPD. Such an approach is also consistent with a recently published lung cancer risk model from the Prostate, Lung, Colorectal, and Ovarian Cancer Screening Trial (PLCO) study that includes these variables. In conclusion, while the results of the NLST provide evidence that lung cancer mortality can be reduced through CT screening, we suggest that better targeting of high risk smokers can substantially improve sensitivity and specificity through pre-selection based on multivariate risk models.